Chris Beaman is the assistant director of membership & chapter services and oversees the Chapter Services team and operations at KDP headquarters. Karen DeLawter is the regional chapter coordinator for the West chapters, online chapters, and international chapters and works to support chapter leaders in those sectors. Chris has previous chapter leader experience with his collegiate chapter, and Karen has worked with chapters for nearly nine years. 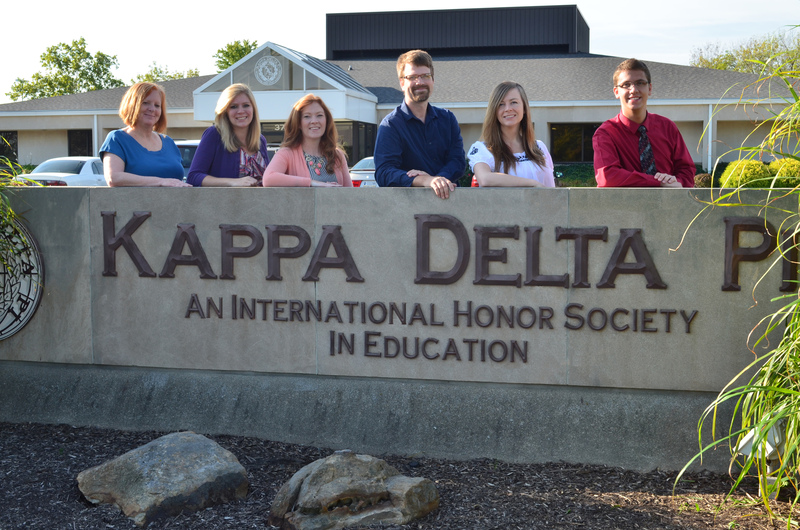 Chris and Karen are part of the KDP chapter services team. Karen is pictured on the far left, and Chris is pictured on the far right. Idea swapping should be framed just like the “take a penny, leave a penny” containers at the convenience stores. 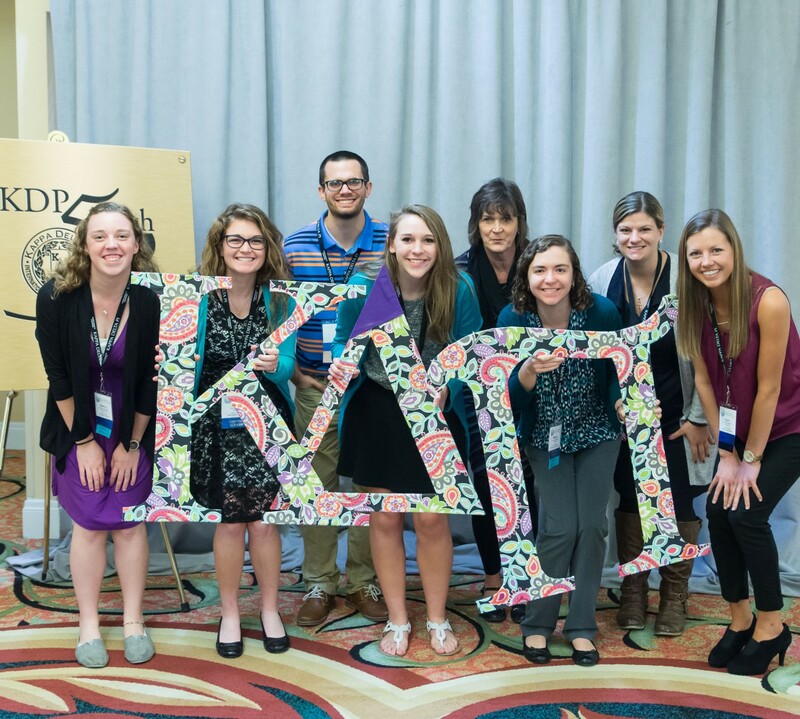 No matter how many years you’ve been involved with Kappa Delta Pi and your chapter, you have excellent ideas to share! Assuming you’re like us, you also love gaining ideas by sorting through tried-and-true programs to use them in your own chapter or setting. When we heard that Sept. 10 was National Swap Ideas Day, we initially wanted to compile list after list of ideas to share with you that you could implement at your chapter. Then we remembered our “take a penny, leave a penny” philosophy, so we decided that we’d just like to leave a couple of pennies for you. A question we have for you is: how do YOU get your members involved and engaged? I’m assuming you wrote down answers like the examples below. We are here to help you if you answered with choices 1 or 2 above by offering some of our ideas that we’ve collected over the years, and if you answered with choice 3 above by writing down an idea or two, we are here to help you share this idea with your peers around the nation. We hope that you are realizing that even we may play the penny-taker role every now and then. A starting point for any chapter trying to increase programming and member engagement is the KDP website. There is not only an entire portion of the site dedicated to chapters, but there is also one dedicated to chapter resources. By browsing this site, you can find ideas for supporting the following that usually take place in a chapter. One of Chris’ favorite programs to share with chapters is the Mock Interview Program that was originally submitted by Alpha Eta Chapter at Missouri State University. We list this as a moderate program to put together. Imagine, though, the benefit that chapter members would see in attending and being an active part of this event. The submitted program—complete with a planning/execution guide—is outlined on our website with the materials needed, a how-to list, and even potential ways to enhance the event. KDP makes running interview programs very easy by offering a plethora of resources in the Career Center and Downloadable Resources that offer interviewing tips, suggestions, and even common interviewing questions. You’ve heard the saying “build it and they will come.” How true this is for chapters; provide food and people will come! The most inventive that Karen has heard is a Root Beer Float at the beginning of the year that has grown into a much anticipated event by the entire School of Education at one institution. Another welcomes students back to the second semester with Hot Chocolate. So much camaraderie, connecting and fun can center on the sharing of food. Many chapters use food as one of the jump-starts to a networking event or portion of a chapter meeting. Who doesn’t like the smell of freshly popped corn? Now that we’ve shared some of our ideas and resources with you, we want to remind you that we KNOW you have excellent ideas to share regardless of how you answered the question at the beginning of this post. We’ve only started the idea swap; below are some great ways to keep it going. Remember, it’s up to all of us to help each other. So, every time you take an idea, remember to give an idea. Or, if you feel as though you have lots of ideas to give, do so often. Just like the pennies at the convenience stores, you never know who you might be helping along the way.